PITTSBURGH, Pa. – How sweep it is! Grand Valley State went 2-for-2 at the 2018 NCAA Division II Cross Country Championships on Saturday morning as Jerry Baltes’ squads swept the team titles on a muddy day at Schenley Park in Pittsburgh, Pennsylvania. Individual titles went to Marcela Laguera of CSU Pueblo (31:46.4) and Sarah Berger of Grand Valley State (22:07.7) after they each surged in the final 400 meters for their respective gender’s crowns. 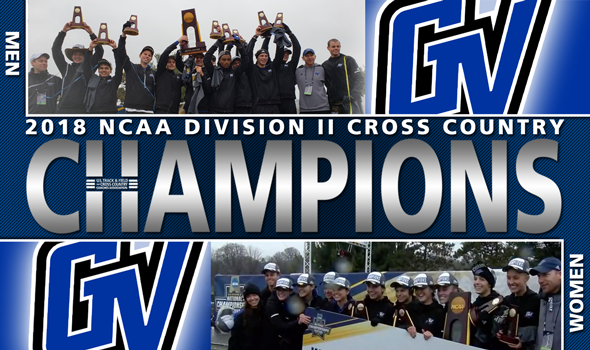 GVSU had never won a men’s team title in cross country before. The Lakers finished runner-up in four of the past five years to Adams State at this very meet, but never got over the hump. That all changed this morning as GVSU used a complete team effort to get it done. The Lakers were one of two teams to put four runners in the top-30, but the only team to put two runners in the top-10. The aforementioned Panning finished second in 31:53.6, while Enael Woldemichael finished sixth in 32:26.4. And once Ben Zaremba crossed the finish line as the team’s fifth runner, the celebration commenced. It wasn’t an easy win for GVSU, though, as it fought for every point and every place. GVSU moved up from fifth at the 1.7K split to fourth at 2.8K, third at 3.8K, second at 4.8K and then took the lead for good by 5.8K. The Lakers had to hold off a hard-charging effort from 2015 national champion Colorado Mines down the stretch. GVSU finished with 89 points, 10 fewer than the Orediggers’ 99. Western Colorado and Adams State rounded out the podium teams with 117 points and 175 points, respectively. The battle for the team title in the women’s race was never in doubt as the Lakers took control early and put the throttle down. GVSU, led by Berger, opened up a 52-point lead at the 1.7K split over Adams State and pushed it to 61 points by 2.9K. The Lakers packed up well behind Berger as they put three more runners in the top-10 overall. Allie Ludge and Hanna Groeber finished fifth (22:39.7) and sixth (22:40.6), respectively, while Gina Patterson crossed the finish line ninth in 22:53.3. GVSU won its fifth national title in the past seven years (sixth overall) as it finished with 41 points. That was the lowest score by a winning team since Adams State scored 31 in 2004. UMary, in its eighth appearance at NCAAs as a team, finished runner-up with 89 points. This was the second year in a row that the Marauders ended up in the No. 2 spot. Adams State and Western Colorado, teams that were No. 1 and No. 2 in the Pre-Championships Edition of the National Coaches’ Poll, finished third and fourth, respectively.